Grimgor Ironhide is the most bloodthirsty, violent and destructive of all the Black Orcs. If a single day went by without a battle, Grimgor was known to start camp-decimating arguments, his one good eye blazing with eagerness to find fault and start a good scrap. Two days without a battle and Grimgor would smite anything he could reach. No one knows for sure what would happen after three days, but even scarred veterans tremble just thinking about it. It is this unquenchable thirst for battle that has marked Grimgor as one of the most feared Orcs of all time – he is the harbinger of Gork and the destroyer of all that stands before him. We recently attended the “After The Storm” event, a narrative campaign set after Archaon’s invasion of the Old World known as the “Storm of Chaos”. A number of well-known special characters popped up over the weekend, painted by the organisers, and were controlled by different players depending on the narrative at that point. Knowing this would be the case, I volunteered myself to paint Grimgor Ironhide in anticipation of the event. While the standard GW model is good, I realised as I was painting that it didn’t convey the personality of Grimgor anywhere near as well as the black and white artwork featured in the Orcs and Goblins army book. 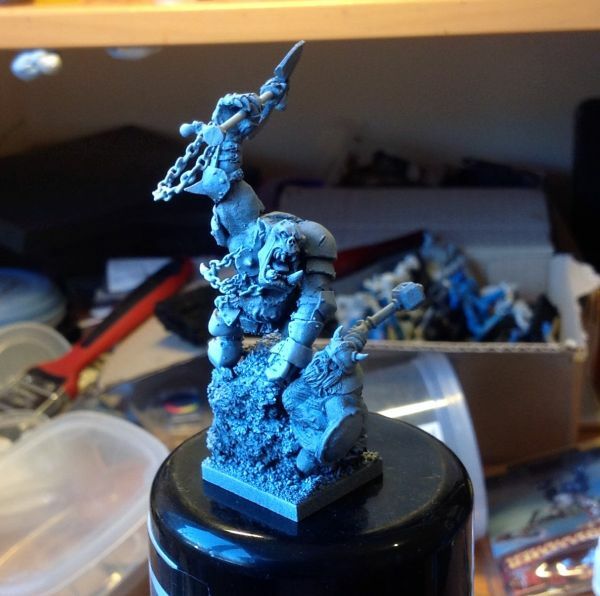 The stock GW model is standing tall, waving a severed head in one hand, and raising his axe to point towards the enemy with the other hand. The pose suggests he may be taunting the enemy and directing his troops forward to attack. From the background about Grimgor, I can’t imagine this being his leadership style! I can much more easily imagine him tearing towards the enemy as fast as possible, regardless of whether the rest of his army bothered to follow him or not, to begin hacking and rending his way through his opponents. His artwork conveys exactly this image- not another Orc in sight, but Grimgor alone surrounded by dead or dying Dwarfs, hacking with his axe while simultaneously punching a Dwarf and (I imagine) stamping on anything left over! Inspired- I decided to have a go at converting the existing model to match this iconic bit of artwork! 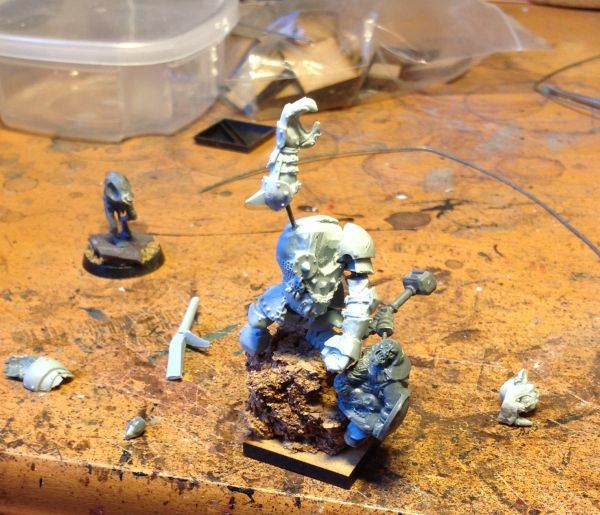 It was vital that I get hold of a Finecast version of Grimgor for this conversion, as the sheer amount of cutting would have been impossible on a metal mini- not to mention that Finecast is fantastic for conversions as it can be heated and bent! 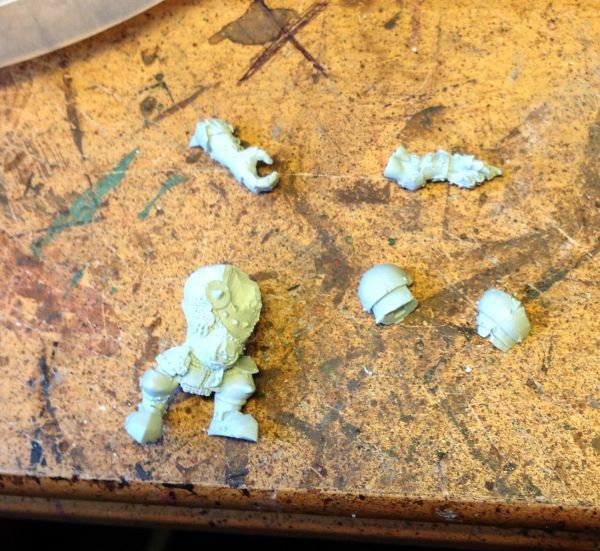 I carefully cut him down to his component parts- removing the severed head from the right hand, cutting both shoulders away from the body, and removing the feet from the pile of shields and the base tag (he would be pinned onto a base anyway so he didn’t need the slotta tag). Gitsnik (Grimgor’s trusty axe) was removed from his left hand so that it could be bent into a fist to match the punching action from the art. I also completely removed the right shoulder pad from the arm, and cut away the bicep entirely, as this would need to be re-sculpted. 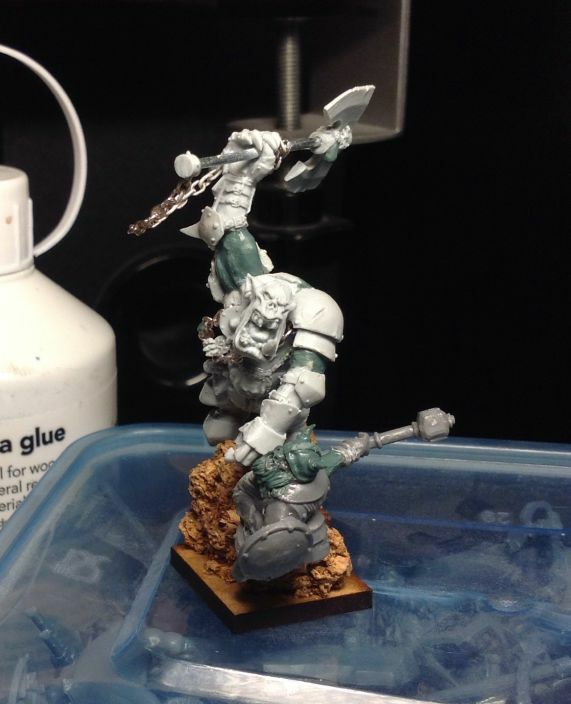 Getting the pose right was extremely important to make the model look dynamic enough- Grimgor needed to be leaning further forward and slightly to his left to give the impression of him driving forward, and hefting the axe at the same time. His legs also required reposing and repositioning so that he would be pushing forward, almost like a rugby player, rather than standing still like the original. For this, I used a combination of hot water and a hairdryer to gradually warm and bend the model into the desired position! Once I was happy, he was dipped in some ice cold water to set his new pose. 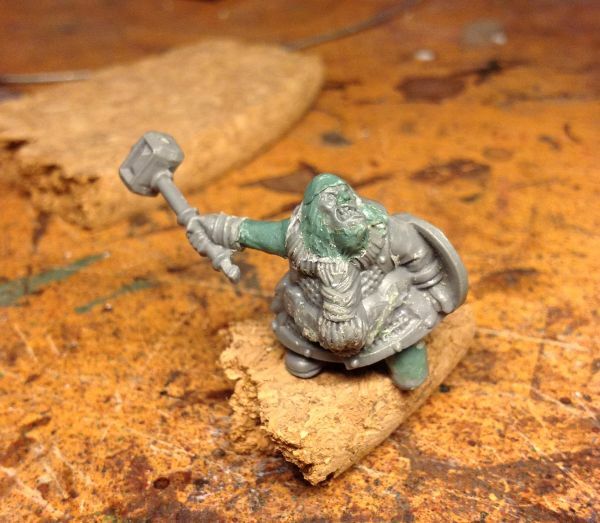 At this point, he was ready to be pinned to a scenic base (leaving room for a Dwarf victim at the front). Re-attaching the arms was the next hurdle. A significant amount of material on the chest near his left arm needed to be removed so that the shoulder could be reattached punching across his body. The other arm (or, the forearm that was left), was pinned and positioned on the right arm, bending where I required the elbow to be, and carefully measured to make sure the resulting arm would be the perfect length. This pin would then form the skeleton of the right bicep onto which I could re-sculpt the details once the superglue was dry. More bending of the left (punching) arm was needed using the hot water/hair dryer technique. This arm needed to be almost perfectly straight, with only a slightly bent wrist, to convey the impression of real power having gone into the punch- too bent and it would look weak and pathetic. The dynamics of the Dwarf victim would also add to this but it was important to get the arm correct initially for the overall effect to work. With the arms attached, the head could also be pinned in place (slightly off the body, elongating the neck, to give the desired angle and slightly less stooped posture). Grimgor’s trinkets were carefully removed with a very sharp knife, and reattached swinging off the body to match Grimgor’s motion. This further adds to the appearance of movement in the model, and was complimented by the addition of chains on the body and axe, again matching the overall motion. 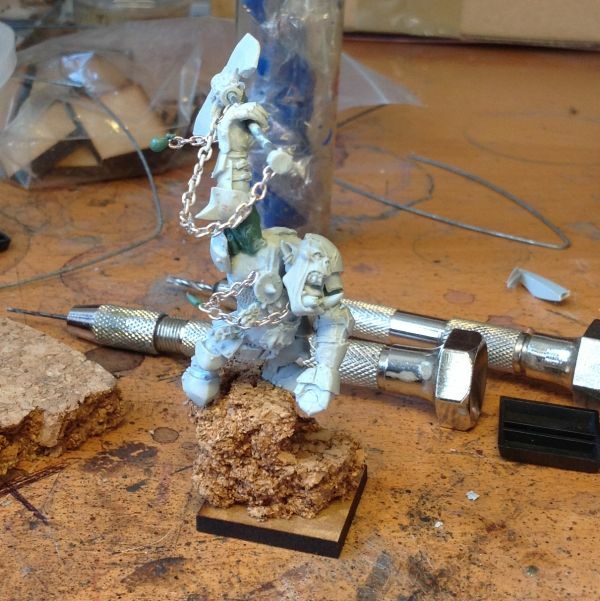 The trinkets had to be supported at the back by a small amount of greenstuff to avoid being knocked off- after all this model would be for gaming, not Golden Demon! Then began the sculpting- re-sculpting of both biceps (taking care to get the required smooth finish), the rebuilding of any damaged armour plates (these were trimmed with a very sharp knife once cured to give the sharpest possible edge) and the addition of a few trinkets such as pouches around the waist, to cover any details removed at earlier stages, or “teef” attached to the swinging chains etc. At the same time- work was ongoing on the Dwarf victim himself. 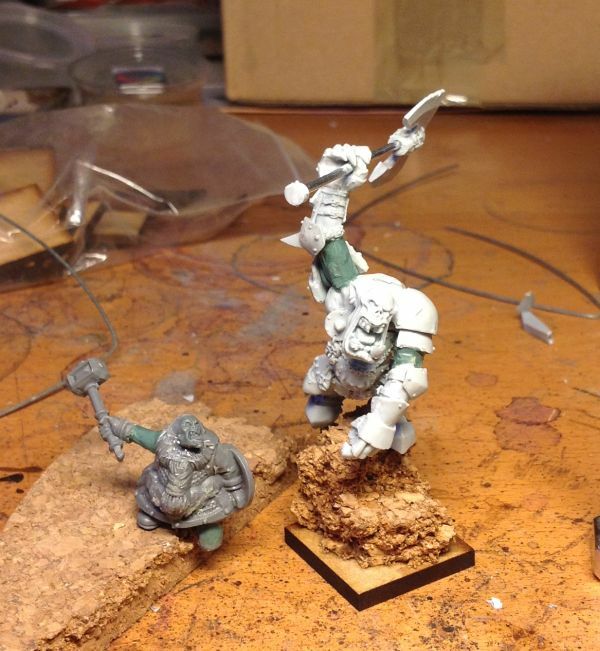 The challenge was to make the Dwarf as dynamic as possible, despite being based on the extremely static “Skull Pass” dwarfs. I chose a dwarf with the shield down, as if he had dropped his guard after Grimgor’s strike, and removed his weapon arm at the shoulder and wrist so that the hand could be reattached with a long pin to be outstretched, as if falling, and the sleeve re-sculpted over the skeleton. 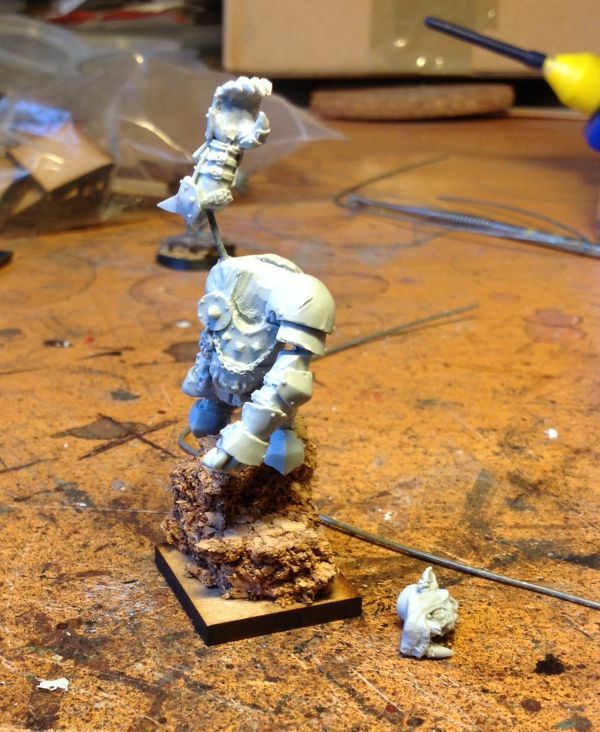 The head of the dwarf was completely removed, leaving only the collar and the lower half of the beard. This allowed me to attach a VC Ghoul head, with a suitable goofy “I’ve just been punched!” face. Since ghouls have no nose, this had to be carefully re-sculpted, before fleshing out the cheeks (Dwarfs are rather chubbier than Ghouls!) 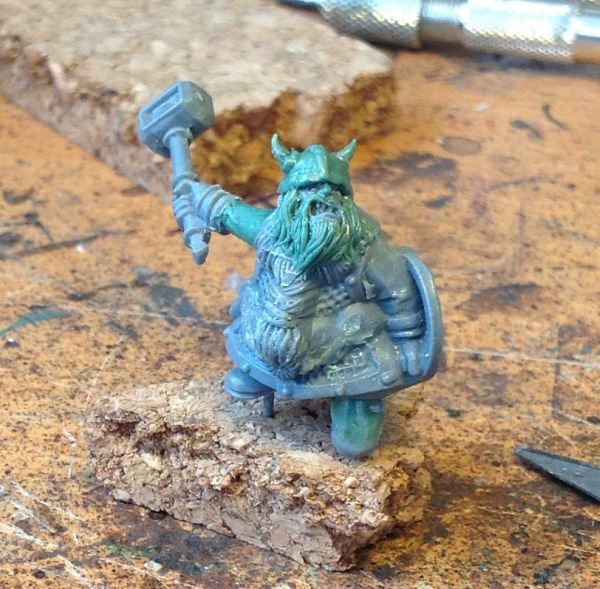 and sculpting the beard to blend in with the existing lower half. Finally the helmet was re-sculpted including details such as horns and banding using some of the other Skull Pass models as reference. Once again, the final details such as trinkets on the belt were added and the victim was finished! So, that’s it for now! Keep an eye out for the next blog post where I’ll be showing some step by step photos of the painting for Grimgor. 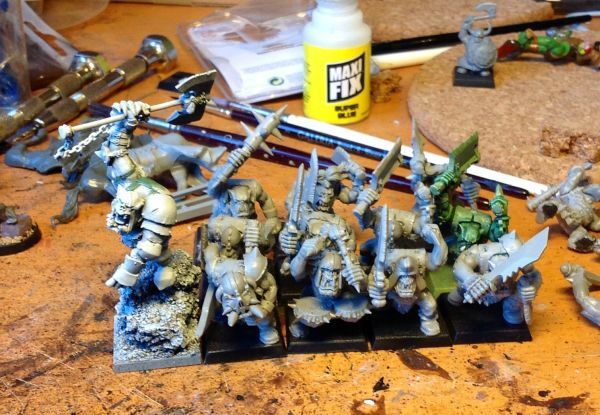 This entry was posted in Competitions, Orcs and Goblins, Warhammer Fantasy and tagged grimgor conversion, Grimgor Ironhide, grimgor ironhide art, grimgor ironhide artwork, grimgor ironhide conversion, warhammer conversion, warhammer grimgor art, warhammer orc art, warhammer orcs. Bookmark the permalink.